The Marquam Bridge /ˈmɑːrkəm/ is a double-deck, steel-truss cantilever bridge that carries Interstate 5 traffic across the Willamette River south of downtown Portland, Oregon. It is the busiest bridge in Oregon, carrying 140,500 vehicles a day as of 2016. The upper deck carries northbound traffic; the lower deck carries southbound traffic. The bridge was designed and built by the Oregon Department of Transportation at a cost of $14 million. The lower southbound deck was opened on October 4, 1966, and the upper northbound deck on October 18, 1966. The main span of the bridge is 440 ft (130 m) long and the two side spans are 301 ft (92 m) each. Vertical clearance of the lower deck is 130 feet (40 m) and the upper deck is 20 feet (6.1 m) above the lower. It is named after Philip Marquam, a state legislator and Multnomah County judge, who owned much of Marquam Hill where Oregon Health & Science University and the Veterans Affairs Medical Center now stand. At the eastern end of the bridge, on the lower deck, is a ramp stub which was intended to connect to the cancelled Mount Hood Freeway. 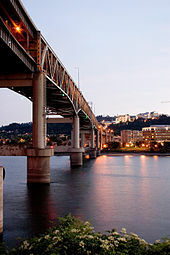 As it has great importance, the Marquam was the first Portland bridge to undergo a seismic retrofit in 1995. It was built with economy in mind and the public reacted unfavorably to the structure's aesthetics, including a formal protest from the Portland Arts Commission. (In particular, it blocked the view of downtown from the Union Avenue Viaduct.) This led to public input in the design of the Fremont Bridge. During Mayor Vera Katz's State of the City address in 2001, she said, "It’s like having the Berlin Wall dividing east and west, with all the subtle charm of the Daytona 500 smack dab in the middle of our city." The bridge was designed with three lanes in each direction with shoulders on each deck. Today, it carries four narrow lanes and no shoulders on each deck. Options historically considered have been to reroute I-5 over the existing I-405 alignment, connecting I-84 to I-5 at the Fremont Bridge interchange, following the US 30 alignment, and removing the Marquam permanently. Another option would build a tunnel under the Willamette River approximately following the existing I-5 alignment, and remove the Marquam Bridge permanently. Proposals have been made to replace the Eastbank Freeway portion of I-5 with a tunnel, connecting with the existing alignment at the Marquam Bridge and the Rose Quarter. This would free up space along the Willamette River for development. ^ "Historical Traffic Data" (PDF). 2016 Traffic Volumes On State Highways. Oregon Department of Transportation. Retrieved July 3, 2018. ^ Wood, Sharon (2001). The Portland Bridge Book (2nd ed.). Oregon Historical Society. ISBN 0-87595-211-9. ^ Hamilton, Don (January 18, 2002). "East-side story" (PDF). Portland Tribune. p. 2. Retrieved May 23, 2015. ^ Maus, Jonathan (April 6, 2012). "Adams releases I-5 tunnel concept plan for public comment". Bike Portland. Retrieved August 16, 2015. Wikimedia Commons has media related to Marquam Bridge.